Ranked #1 on our list of Top Division One schools is Stanford University. Their unmatched combination of academic excellence as well as NCAA national championships in a number of DI sports puts them securely at the top of the list. Of course, their academic requirements for potential athletes is also second to none. Learn more about Stanford’s academic eligibility requirements here. Coming in at #2 is the University of California at Los Angeles (aka UCLA), the Bruins. They have a great page that has simple explanations of what to expect and what is required to become a UCLA Bruin. You can learn more on the UCLA NCAA athlete eligibility page. Making the list at #3 is the University of Southern California. The USC Trojan athletic legacy is strong. Great information on how prospective college athletes can earn their way into the Trojan athletics program can be found on their Prospective Trojan athlete page. Perhaps not as well known to many folks outside of California is the fact that UC Berkeley is not just a great place to earn a degree. UC Berkeley’s sports legacy is quite robust. A great school for students who excel both on and off the field. Learn more about prospective student athlete requirements here. Making the list at #5 is Yale University. Yes, you read that correctly. Clearly this Ivy League school is best known for its academic prowess, but did you know they also have a deep tradition of athletics as well? Another great school to consider if your child is a master of both sports and academics. Learn more about Yale University’s student athlete requirements here. Coming in at a respectable #6 is Penn State University. While there has been some controversy surrounding the football department at Penn State in recent years, the Nittany Lions are clearly on the comeback trail. And, there is certainly no disputing the academic excellence at Pennsylvania State University. Go Blue! Making the list at #7 is one of the biggest names in college sports, the University of Michigan. One of the strongest legacy traditions in the country lives and breathes at the University of Michigan…and playing for coach Harbaugh would clearly be something your son could tell his grandchildren about. Learn more about the University of Michigan student athlete eligibility requirements here. The first ACC team on the list is the University of North Carolina. The Tarheels sport one of the better websites for prospective student athletes loaded with information for students and parents of prospective NCAA athletes. Learn more about the prospective student athlete requirements for the University of North Carolina here. Hook ’em Horns. Making our list at #9 is the University of Texas. Known as a sports powerhouse, the University of Texas at Austin has developed a number of first tier academic programs such as their business and engineering schools. A great option for prospective student athletes from all over the country, not just from the Lone Star State. 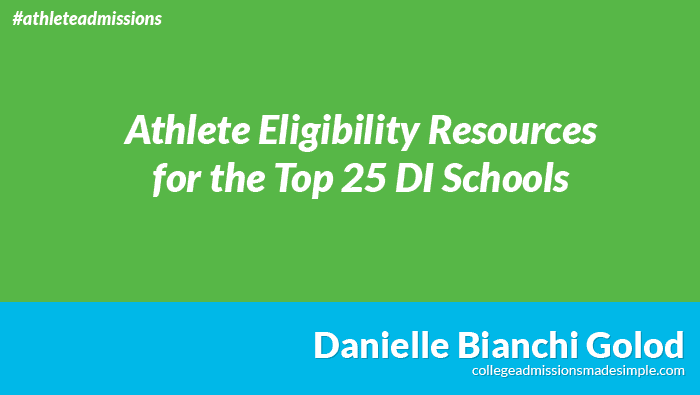 Learn more about prospective student athlete eligibility requirements here. Rounding out the top 10 on our list is Princeton University. Princeton usually finds itself atop the US News and World Report list of top universities each year academically. Most people are surprised to find out that Princeton has a robust athletic department which has seen much success over the years. Learn about Princeton University’s athlete eligibility requirements here.